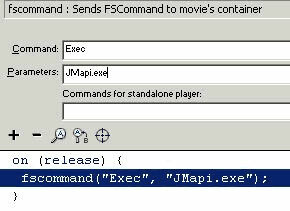 JMAPI takes you beyond the capabilities of JEmail to create mail-enabled applications. Now you can launch the end user-s e-mail client in the Projector file. JMAPI is compatible with all major e-mail clients -- Outlook, Outlook Express, Lotus Notes, Eudora and Netscape Mail, giving you more control than ever before. Any Projector challenges you-ve faced with non-functioning e-mail links, sending attachments or line breaks in the body copy are a thing of the past. MAPI stands for Messaging Applications Programming Interface which is supported under Windows by Microsoft Mail for PC. This is the heart of Microsoft's messaging programs. The MAPI is an extensive library of functions and services that developers can use to create mail-enabled applications. 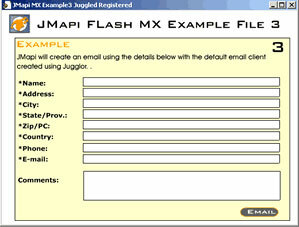 FlashJester-s JMAPI uses these libraries to send e-mails more reliably and efficiently than the older techniques in JEmail. JEmail is great for sending emails from Projectors, but when you need more, JMAPI is your solution. JMAPI is compact. Each tool is only 24kb and you need only one copy for all of your links. How about a virtual vixen for your screen? Let this lovely lady strut her stuff as she walks around your screen. It uses the transparency feature in Jugglor v2. See how smooth she moves.